Mainly clear. Low near 45F. Winds NNE at 10 to 20 mph.. Mainly clear. Low near 45F. Winds NNE at 10 to 20 mph. 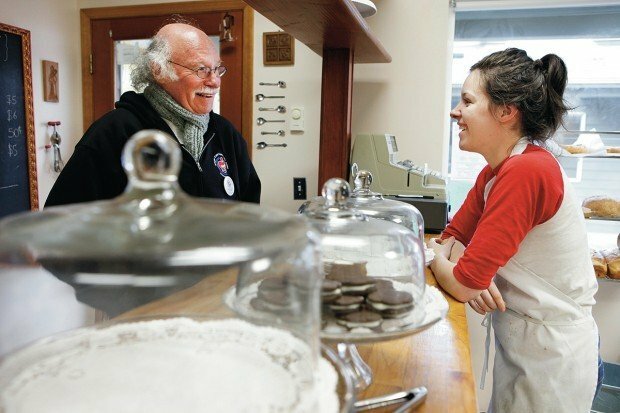 Hannah Russell chats with Carl Siminow at Hannah MariesÕs Bakery in North Bend. Siminow came to see how the new bakery is doing. Hannah and Beebo Russell took over the bakery in early March. Hannah and Beebo Russell recently opened Hannah Marie's bakery in North Bend. They never planned to open a bakery, but the opportunity to take over the existing business appealed to the newlywed couple. NORTH BEND — A year ago — when Hannah Russell entered the Oregon Coast Culinary Institute — she made two vows: She would never get married, and she would never open a bakery. “It’s proof that God has a sense of humor,” Russell said, smiling. She stirred a bowl of biscotti batter at her new North Bend bakery, Hannah Marie’s Artisan Breads and Pastries. Her husband, Beebo, smiled at her from across the room. 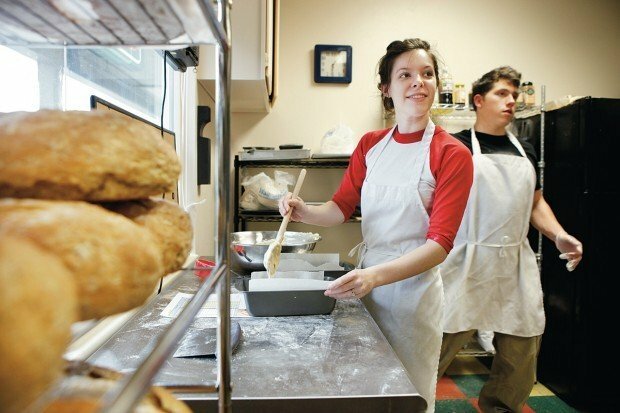 Hannah and Beebo Russell — 21 and 22 — opened the bakery in early March, just two months after their wedding. Hannah Marie’s — located at 1948 Sherman Ave. — replaced Gary’s Bakery, which opened at the location in 2011. For now, the couple is keeping production low, with a few loaves of bread, biscotti, and something sweet on the side. They plan to construct a large glass display case beside their cash-register so they can store larger quantities of goodies within the month. “We’re limited by space now,” Russell said. But the Russells have big plans. Soon they will bake donuts, cinnamon rolls and croissants, for a start. Russell learned many recipes from the Southwestern Oregon Community College culinary program. The couple learned others from the bakery’s previous owners. Still others are their own creations. “I feel a lot of love in that place, and sweetness,” said Silva Bennett, one of Hannah Marie’s first customers. Bennett comes by often to try Russell’s new breads. “Their biscotti is wonderful,” she added. Many of the Russells’ customers are people who used to frequent Gary’s, Russell said. “Anytime his old customer comes in we ask if there was something special so we can keep it going,” she said. Other customers have wandered in off the street, lured by the smell of baking biscotti. Business is “slow, but surprisingly good for the fact that we’ve had no advertising,” Russell said. The Russells hope to throw a grand opening after completing renovations sometime in April. CHARLESTON — The 2018 Charleston Seafood, Beer and Wine Festival celebrated its 28th year this weekend at the Charleston Marina featuring over dozens of vendors from around the region.